Being a working mother and wife makes for a crazy life. I need simple quick recipes that I can share with my family. 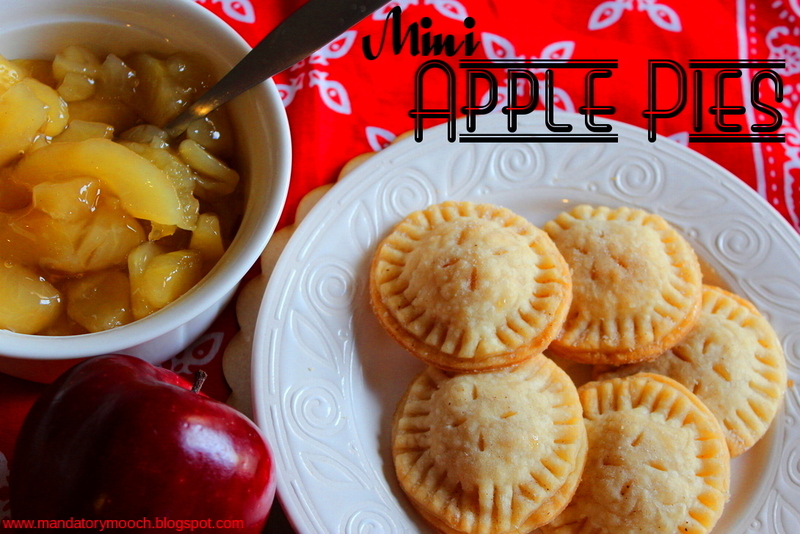 Today I'm sharing my newest creation...easy Mini Apple Pies. They will fill your house full of a warm cinnamon apple smell without slaving away in the kitchen. I can't wait to try them with other wonderful fillings too. I hope you enjoy!! Cut out circles with cookie or biscuit cutter. I used a 2.5" biscuit cutter. Place pie crust circles on a baking sheet. I always use parchment paper. Add a teaspoon full of filling to middle and top with another circle. Cut vent hole in the top and sprinkle with cinnamon and sugar. Bake at 450 degrees for 10 - 12 minutes. Also linked up to THESE GREAT PARTIES!!!! These are so cute. I bet they taste great too. Oh my goodness, these are adorable. I'll definitely be giving these a try. So glad to have found you on SixSistersStuff.com link party page! These are toooooo cute for words!!! Gonna give them a try.....bake at 350 for maybe 20 minutes???? I'm so glad you said something. The baking portion got cut off the recipe. I added it back on...450 degrees for 10-12 minutes. They bake fast. Enjoy!! These are so cute! What a wonderful thanksgiving dessert idea! Thank you so much for linking up to Sunday's Sweet Confessions over at mommy's sweet confessions! Have a great day! Love this idea,...so cute and look great! These looks absolutely divine! I looove apple pie! I'd love for you to link this up to my party! I love mini desserts and these are sooo cute! Really want to try these. Your Mini Apple Pies look delicious and lots of fun. Have a great weekend and thank you so much for sharing with Full Plate Thursday. These look so cute and delicious! Need to try them soon! Thanks for sharing on Foodie Friends Friday. Please come back to VOTE on Sunday! These would be perfect for a dessert bar -- or Thanksgiving! Thanks for linking on Busy Monday! This is my first time here. Looks yummy! Thanks so much to linking it to the Thanksgiving Treats & Fall Fun party! I'm one of your co-hosts. Have a great day! love these mini pies look awesome!! These look delicious and are the perfect size for little hands. Thanks so much for linking up to Creative Thursday. Can’t wait to see what you share this week! Have a wonderful week. Hi there! Just wanted to mention that I made these with my kids for our "Letter A week" of homeschool preschool and they were a HUGE HIT - delicious and the perfect size! Thanks for posting this great recipe! Finger food at its best! Thanks for joining the Thursday Favorite Things! How cute and yummy too! I need to make some mini pies! Thanks for sharing the Inspiration Spotlight Party pinned & shared. Yum these look so yummy. Thanks for sharing with us at Family Joy Blog Link Up Party this week. Glad you joined us. These apple pies are picture perfect! These are fabulous! A true all American comfort food. These are so cute and fun!! Thanks for sharing with us at Throwback Thursday!